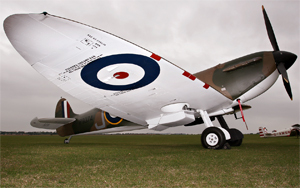 The theme for this years Duxford Airshow was the celebration of the iconic Spitfire. The first Spitfires to enter service with the RAF on August 4th 1938, were with 19 Squadron based at Duxford so it is fitting that its 75th anniversary be marked at the wartime airfield. The legendary fighter was a huge success , with Supermarine developing no less than 24 marks of Spitfire and a final tally of 20,351 being built. Duxford’s number of Spitfires attending the show were a little low for a birthday bash, but the quality of aircraft were second to none with the newly restored MK1 P9374 on the flight line for its first airshow outing. Duxford had brought together several marks of the Spitfire to show the development stages it went through, which I thought was a top idea. Ground attractions are never a problem at Duxford. The well presented museum has so much to do besides the museum itself. For this year Airfix have been running a ‘Make and paint’ zone for families to build and paint a model kit. 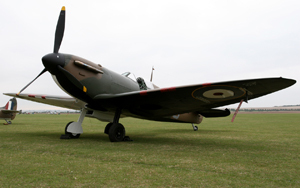 Once finished you can take your masterpiece home and say you built a Spitfire at Duxford!! 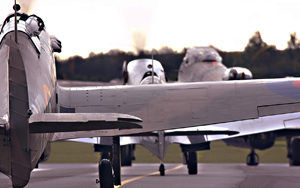 Another great touch was the re-enactment of a genuine bomber raid from WW2. Held in one of the period huts, the show was historically accurate and the ‘crew’ wore authentic flying gear to boot! I would highly recommend this to anyone visiting a Duxford Airshow..
A highlight for me was the sight of the MK1 Spitfire out on the grass. This has been restored to a high standard and looked absolutely magnificent. 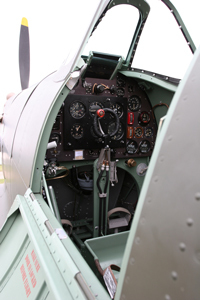 I was also lucky enough to be able to sit in one of the Spitfire TR9’s (in the front seat too!!) It was amazing to see just how small the cockpit was on the spitfire, but also how everything was so well set out. It was nice to see that the organizers had invited aircraft from the major nations connected with the Spitfire in WW2. France, Poland and the USA all sent aircraft from their Airforces to help in the commemoration. On the Saturday, the French opened the show with an Alpha jet. This was superbly flown and I particularly enjoyed the ‘crazy flying’ manouvre. This involved the Alpha Jet bucking up and down along the crowdline. The wing waggle signaled the end of the display and as it departed for Cambridge, two Hawker Nimrod’s took off to hold while John Romain brought in the Hispano HA-112 Buchon from HAC. 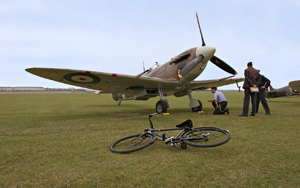 The collections Hurricane was due to display with the Buchon, but a fuel leak scuppered the Saturday show. John Romain did however do a lovely display as a solo, bringing the Hispano in for some really great low passes. 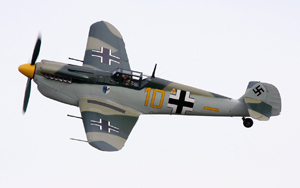 The Buchon-Hurricane pair did get up together on the Sunday for a very pleasant duo act. Another duo came in from crowd right next for a nostalgic look back at the inter-war years. The sight of a pair of Hawker Nimrods was a real treat. The two aircraft used Duxford’s blue skies very nicely performing syncro loops and some beautiful pair’s passes. As Pete Kynsey and Charlie brown put down the Nimrods, TFC’s Hawk trio appeared in the skies. 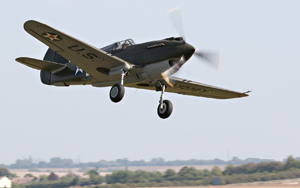 The Fighter Collection are lucky enough to own the only flying Hawk 75 ( a precursor to the P-40 Warhawk stable), A genuine Pearl Harbor veteran P-40B Warhawk and a late version P-40F Warhawk with a Rolls Royce Merlin engine fitted. These three aircraft are a very unique sight and Stephen Grey lead a spirited display. 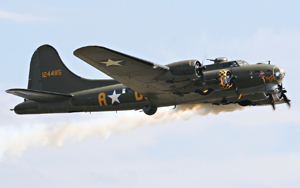 Another Duxford favourite also put on a great display on both days, B-17 Flying Fortress ‘Sally B’ is now the sole B-17 displaying in Europe after the grounding of the French Fortress ‘Pink Lady’. She serves as a memorial to all the crews of the USAAC that flew from Bomber bases in the UK during WW2. As a charity, she relies on donations and fundraising to keep her in the sky. To repay all those who help, the crew perform a pass with 2 smoking engines as a thank you. Hopefully she will be on the show scene for many more years to come!! 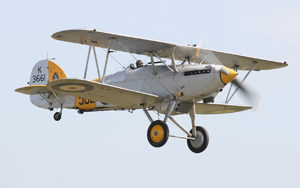 The RAF sent the next aircraft to display, and it was a different sight at a Duxford Airshow. From crowd left appeared a bright yellow Sea King helicopter in the bright blue sky, from 22 squadron based at RAF Wattisham. Whist it ran in, one of the crew was on the runway with ‘smoke on’ to signal a rescue. 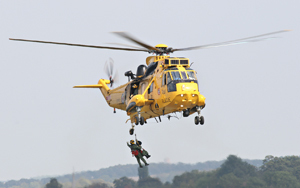 It was great to see the RAF Rescue team doing there stuff, as a winchman was lowered down to collect the stricken crew member from the runway. The helicopter did a few passes before departing back to Wattisham. The same display was also done on the Sunday, in very different weather!! 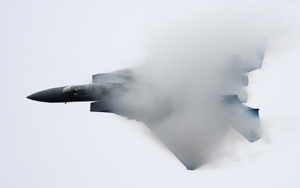 The USAF were next to display with a rare appearance from the F-15 Strike Eagle demo team. 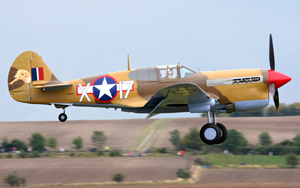 The pilots were brought over from the States especially to display at Duxford September show. As usual we had the typical American build up to the display with the commentator getting more and more excited as the F-15 got closer. There was good reason, this was the best display by a military jet I’ve seen this year. It was dynamic, energetic and high impact. Major Mike “Cash” Maeder did a cracking job and showed the true potential of the Strike Eagle in combat. The simulated Airfield strafe attack and bomb runs were a particular highlight. It was also great to get to contrasting shows due to the weather. Saturday was in lovely clear sky, Sundays display however was in murky grey damp weather. This made for some ‘vaportastic’ shots! Ray Hanna is synonymous with Duxford and a certain Spitfire in particular. Stu Goldspink did a display in Spitfire MH434 dedicated to the master himself on the Saturday. The commentators stayed silent throughout and I’m sure we, that had been lucky enough to see Ray Hanna display all had a few minutes to remember him. 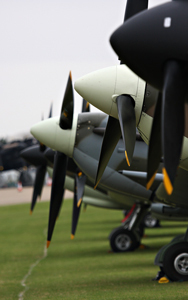 6 Merlin engines followed 434 in the form of the Battle Of Britain memorial flight. I was greatly impressed by BBMF’s fighter pair doing a syncro display with close opposition passes. This is not the normal display by Hurricane and Spitfire, but I hope the BBMF do it again. The pair rejoined the Lancaster for a formation ‘V’ pass before breaking to land. This is the first time in many years that the Lancaster has landed at Duxford. 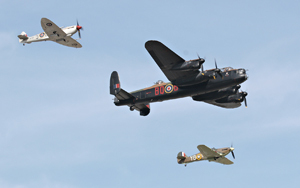 Unfortunately on the Sunday we got a pass by the fighters and the Lancaster took off from Duxford and did not re-appear.. 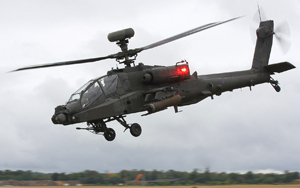 According to the Army Air Corp Blue Eagles Display Team commentator, their Apache had been fully booked by the Taliban for a while, but now they had some time to show us what the amazing Augusta Westland Apache could do. Capt Scotty Hewitt and Bruce Allen put the helicopter through a series of 180 degree pedal turns and 360 degree wing overs before giving a wing waggle to end their slot. The Apaches are due to re-deploy to Afghanistan next year, so it was good to see Duxford taking advantage of them still being here for the airshow. The display was mimicked again on Sunday again to a meaner looking sky. 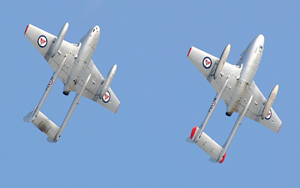 Two silver De-Havilland Vampires from the Norwegian Airforce Historical flight were a welcomed sight over Duxford. They did a nice formation display and their silver scheme looked great against the blue backdrop, a stark contrast compared to Sunday. They opened the show on the 2nd day, but two minutes in the heavens opened up and this signaled a very wet hour or so for the airshow. My only complaint is that their display meant running out a long way thus leaving a few empty gaps in their routine. After the Vampire’s Peter wells and Guy Westgate displayed in the SWIP Silence Twister Duo. There were then displays from the Red Hawks Fournier Duo team in their motorised gliders, followed by a pair of T-28 Fennecs flown by Martin Willing and Dave Southward. The Yak 50’s of the Aerostars also did a stunning display on the Saturday, but even more impressive was the fact that in Sundays display, they did a full show even though it was absolutely bucketing down. They showed true skill by continuing to fly tight formations and opposition passes in the heavy rain. Leon Crease did a nice display from another RAF Type, The Beech King Air. I liked the fact that they chose the Electric Light Orchestra’s Mr. Blue Sky to be played whilst being displayed. Very apt in the Saturday sun, but very ironic with the Sunday deluges!! The landing was also brilliant with RAF Transport pilots now learning the tactical short landings. Leon brought the King Air in High before tilting the nose down to about 50 degrees for a steep landing. Nice!!! Sunday saw 2 different acts. 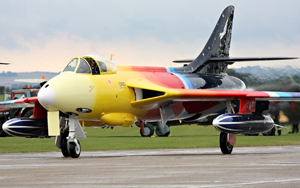 Jonathon Whalley flew a spirited display in his Hunter Miss Demeanor with some nice ‘vapor shots’ to be had. Brendan o Brien also displayed his flying circus which sees him land his modified piper cub on top of a trailer towed behind a Bentley car. 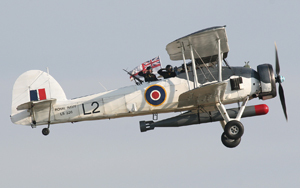 We were also treated to a RNHF Fairey Swordfish display on both days which was as graceful as ever. The ‘string bag’ as its affectionately known seems to lumber around the sky, but has a style and grace which is really pleasing to watch. Both days finished with the obligatory ‘flying flag salute’ pass. With the Swordfish departure, all eyes were cast to the famous hills Synonymous of Duxfords backdrop. 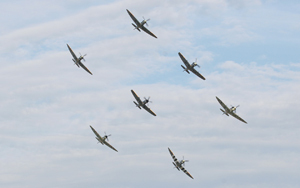 Both days saw no less than 7 Spitfires in the finale. With a couple of passes, the formation broke into two groups, with 5 aircraft in a talichase and the other 2 performing fast passes and loops in front of the big crowds amassed at Duxford. This followed a run and break to land and the end of the September Airshow.